Presents of Mind | Community Options, Inc.
PRINCETON, NJ – Community Options has recently named Phyllis L. Marchand to the board of trustees for Community Options Enterprises. Community Options Enterprises operates several innovative programs as well as entrepreneurial businesses that successfully integrate people with disabilities into the workforce. Marchand served 23 years as an elected official in Princeton Township, and for 12 years as Mayor before retiring in 2009. She recently joined the Community Options board to augment production of their new Princeton VASEFUL flower store slated to open on Witherspoon Street in the fall. One of Community Options Enterprises’ innovative programs is the Red Ribbon Academy, located in Wayne and Hillsborough, NJ, which supports adults who have the most fragile medical disabilities in a way that fosters growth and progress. Community Options also has three businesses that provide individuals retail, management and customer service skills. Presents of Mind is a unique gift shop in Flanders, NJ. The Daily Plan It is a complete office, conference and copy center with locations in Morristown, Moorestown and Princeton, NJ. Vaseful, located in Edison, NJ, is flower shop that offers high quality floral services and delivery to anywhere in the world. Marchand was appointed by the Legislature and Governor to the Delaware and Raritan (D&R) Canal Commission and is a former Commissioner. Mayor Marchand led in state affairs as President of both the New Jersey League of Municipalities and the New Jersey Association for Elected Women Officials. Recognized as “Elected Official of the Year” by the New Jersey Municipal Managers Association. For over 30 years, Community Options has developed housing and employment programs for people with disabilities – serving thousands of people through over 40 offices across 11 states. Community Options provides advocacy assistance to empower people with disabilities because all people – regardless of ability level – should live and work in the community with dignity, choice and self-determination. For more information please visit our website: www.comop.org and to follow along with the ComOpCares campaign, search #ComOpCares on Facebook, Twitter and Instagram. Left to right: Ida Bormentar, Executive Director Community Options; Mary; James A. McKenna, Broker/Owner for Realty of Princeton; Christopher Wilkerson, Managing Partner of BoneFish Grill; Andrew Park, Managing Director of Community Options Enterprises; Melissa Alancourt, Director of Floral Operations for Community Options Enterprises’ Vaseful Flowers & Gifts. 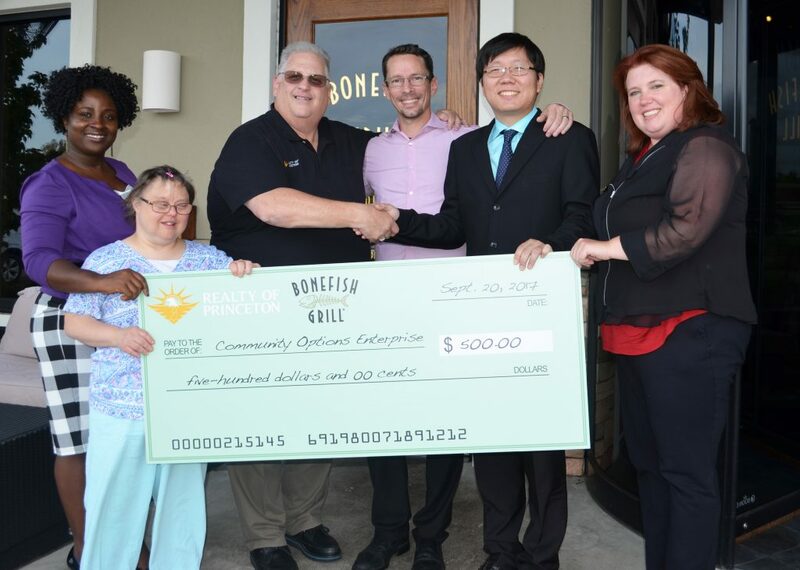 This year, Realty of Princeton and Bonefish Grill celebrated the end of summer with a donation to local nonprofit Community Options of Princeton, NJ. Community Options provides housing and employment support to thousands of individuals with intellectual and development disabilities across 11 states. The donation was made to the organization’s entrepreneurial businesses (Community Options Enterprises) that operate to integrate people with disabilities into the workforce. Jim McKenna, the Broker and Owner of Realty of Princeton, has served on the Business Advisory Council for Community Options since 2015. 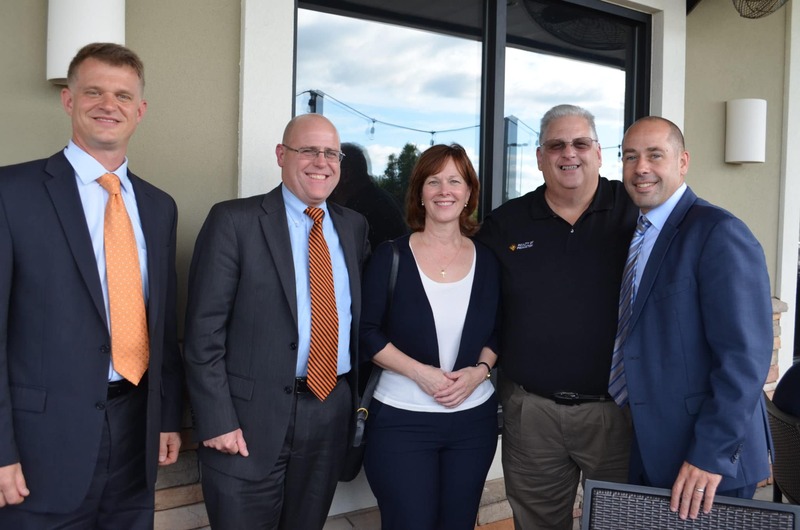 The event was held at Bonefish Grill in Lawrenceville, inside the Mercer Mall. Community Options Enterprises consists of Vaseful, a flower shop in Edison; Presents of Mind, a gift store in Flanders and Daily Plan It, a completely furnished office building that offers rental space and tenancy to local businesses, located in Morristown, Princeton and Moorestown. To learn more about Community Options Enterprises, visit https://comop.org/services/enterprises/. For 28 years, Community Options has developed housing and employment programs for people with disabilities – serving thousands of people through over 40 offices across 11 states. Community Options provides advocacy assistance to empower people with disabilities because all people – regardless of ability level – should live and work in the community with dignity, choice and self-determination. For more information please visit our website: www.comop.org and to follow along with the ComOpCares campaign, search #ComOpCares on Facebook, Twitter and Instagram. No one cooks quite like a grandma – everyone knows that. 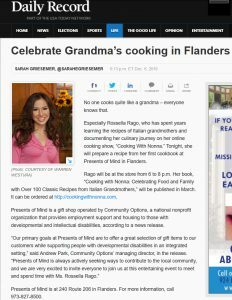 Especially Rossella Rago, who has spent years learning the recipes of Italian grandmothers and documenting her culinary journey on her online cooking show, “Cooking With Nonna.” Tonight, she will prepare a recipe from her first cookbook at Presents of Mind in Flanders. Rago will be at the store from 6 to 8 p.m. Her book, “Cooking with Nonna: Celebrating Food and Family with Over 100 Classic Recipes from Italian Grandmothers,” will be published in March. It can be ordered at http://cookingwithnonna.com. Presents of Mind is a gift shop operated by Community Options, a national nonprofit organization that provides employment support and housing to those with developmental and intellectual disabilities, according to a news release. Presents of Mind is at 240 Route 206 in Flanders. For more information, call 973-927-8500. 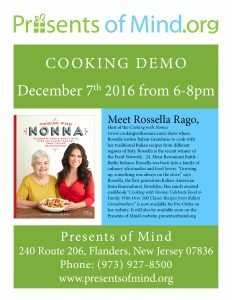 PRINCETON, NJ (November 21, 2016) — On Wednesday, December 7 from 6-8 p.m. at Presents of Mind in Flanders, NJ, cooking sensation Rossella Rago will hold a demonstration of one of her new recipes from her first cookbook that is coming out in March 2017, Cooking with Nonna: Celebrate Food and Family with Over 100 Classic Recipes from Italian Grandmothers. Rago is the host of the popular web cooking show Cooking With Nonna (www.cookingwithnonna.com), which has nearly 650,000 likes on Facebook and more than 15,000 YouTube subscribers. On the show, Rossella invites an Italian-American nonna to cook with her, sharing traditional Italian recipes and fond memories of childhoods in Italy. In 2010, Rossella, together with her mother and her Nonna Romana, participated in the “Italiano Battle” episode of the Food Network’s 24 Hour Restaurant Battle. Rossella spent her childhood in the kitchen with her maternal Nonna Romana, learning the long legacy of recipes from Puglia passed down through the generations for centuries. Launching Cooking with Nonna has allowed Rossella to expand her culinary expertise to much of the rest of Italy. Presents of Mind (POM) is operated by Community Options, Inc., a national nonprofit organization dedicated to providing housing and employment support to individuals with developmental and intellectual disabilities. POM is located at 240 Route 206 in Flanders, NJ. For questions or further information, call 973-927-8500. For over 25 years, Community Options has developed housing and employment programs for people with disabilities – serving thousands of people through 38 offices across 10 states. Community Options provides advocacy assistance to empower people with disabilities because all people – regardless of ability level – should live and work in the community with dignity, choice and self-determination. For more information please visit our website: www.comop.org and to follow along with the ComOpCares campaign, search #ComOpCares on Facebook, Twitter and Instagram. PRINCETON, NJ – Recently, Congressman Lance Leonard (NJ-07) visited Community Options’ Presents of Mind store in Flanders, NJ to learn about its business model and job training. Community Options (COI) is a national nonprofit that provides housing and employment support to individuals with intellectual and developmental disabilities. 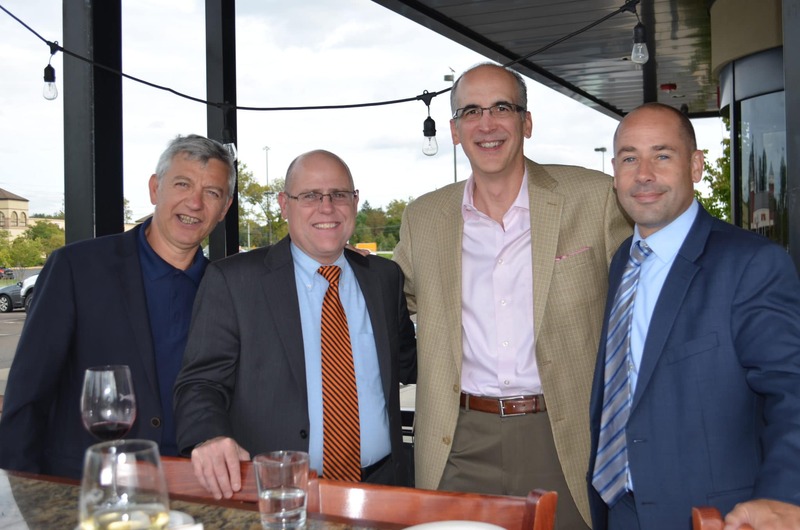 In addition to Presents of Mind, COI operates several other entrepreneurial businesses in the state of New Jersey that provide supported employment and job training for individuals. Presents of Mind (POM), a boutique-style gift shop, opened in the Summer of 2008. POM currently employs 11 individuals supported by Community Options. At POM, individuals learn valuable workplace skills such as point of sale software, soft-selling and customer relations skills, retrieving and processing of orders received online, inventory management, store layout and design and different forms of presentation and display. Community Options also runs a flower shop, Vaseful, in Edison. Employees learn credit card processing, taking phone orders, retrieving and processing of orders received through Vaseful’s website, shipping and distribution, inventory management, as well as floral processing and arranging. COI operates four Daily Plan Its (DPI), which is a complete office, conference and copy center that offers furnished office rental space or virtual tenancy to a variety of businesses. The DPI gives people with disabilities an opportunity to earn minimum wage or better, learn new skills and find employment in the community with their new skill set. State of New Jersey’s Director of Vocational Rehabilitation Services Alice Hunnicutt visits Community Options’ Presents of Mind in Flanders, NJ. PRINCETON, NJ – Last month, Alice Hunnicutt, the State of New Jersey’s Director of Vocational Rehabilitation Services (DVRS), visited nonprofit Community Options’ entrepreneurial businesses; the Daily Plan It in Morristown and Presents of Mind in Flanders, NJ. Community Options, a national nonprofit that offers housing and employment supports to people with intellectual and developmental disabilities, provides services through DVRS and recently were approved to provide trial work experience. The Daily Plan It (DPI) is a Community Options Enterprises’ business which was created to train and employ people with disabilities. The DPI is a complete office, conference and copy center that offers furnished office rental space or virtual tenancy to a variety of businesses. The DPI gives people with disabilities an opportunity to earn minimum wage or better, learn new skills and find employment in the community with their new skill set. Presents of Mind, an enterprise of Community Options, Inc., is a boutique-style gift shop located at the Mall at 206, on Route 206 South in Flanders, NJ. It is an entrepreneurial business that provides job training and employment to individuals with developmental disabilities. Presents of Mind employs several adults with disabilities as retail associates. They work with cross-trained employment specialists who have experience in both retail and job training. All of the functions of a typical business are incorporated into the training program at Presents of Mind, including sales, inventory, maintenance, and design. Audrey Stymest of New Brunswick, from left, Camille Haque of North Brunswick, Darius Ronkowitz of East Brunswick, Katrina Roussel of Monroe and Mary Santasine of Edison work together at Vaseful Flower and Gifts in Edison, a full-service retail flower shop that also offers full-time and part-time employment experience, providing support as well as camaraderie for people with a range of disabilities. For 17 years, the purpose of Vaseful Flower and Gifts has been two-fold—a full-service retail flower shop that also offers full-time and part-time employment experience for people with a range of disabilities. 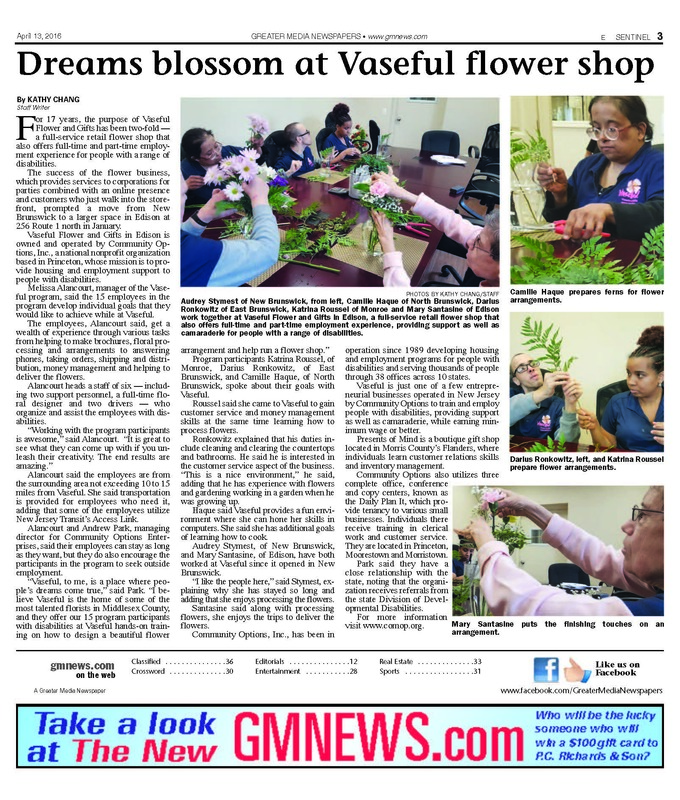 The success of the flower business, which provides services to corporations for parties combined with an online presence and customers who just walk into the storefront, prompted a move from New Brunswick to a larger space in Edison at 256 Route 1 north in January. Vaseful Flower and Gifts in Edison is owned and operated by Community Options, Inc., a national nonprofit organization based in Princeton, whose mission is to provide housing and employment support to people with disabilities. Melissa Alancourt, manager of the Vaseful program, said the 15 employees in the program develop individual goals that they would like to achieve while at Vaseful. The employees, Alancourt said, get a wealth of experience through various tasks from helping to make brochures, floral processing and arrangements to answering phones, taking orders, shipping and distribution, money management and helping to deliver the flowers. Alancourt heads a staff of six—including two support personnel, a full-time floral designer and two drivers — who organize and assist the employees with disabilities. Alancourt said the employees are from the surrounding area not exceeding 10 to 15 miles from Vaseful. She said transportation is provided for employees who need it, adding that some of the employees utilize New Jersey Transit’s Access Link. Alancourt and Andrew Park, managing director for Community Options Enterprises, said their employees can stay as long as they want, but they do also encourage the participants in the program to seek outside employment. Program participants Katrina Roussel, of Monroe, Darius Ronkowitz, of East Brunswick, and Camille Haque, of North Brunswick, spoke about their goals with Vaseful. Roussel said she came to Vaseful to gain customer service and money management skills at the same time learning how to process flowers. Ronkowitz explained that his duties include cleaning and clearing the countertops and bathrooms. He said he is interested in the customer service aspect of the business. “This is a nice environment,” he said, adding that he has experience with flowers and gardening working in a garden when he was growing up. Haque said Vaseful provides a fun environment where she can hone her skills in computers. She said she has additional goals of learning how to cook. Audrey Stymest, of New Brunswick, and Mary Santasine, of Edison, have both worked at Vaseful since it opened in New Brunswick. “I like the people here,” said Stymest, explaining why she has stayed so long and adding that she enjoys processing the flowers. Santasine said along with processing flowers, she enjoys the trips to deliver the flowers. Community Options, Inc., has been in operation since 1989 developing housing and employment programs for people with disabilities and serving thousands of people through 38 offices across 10 states. Vaseful is just one of a few entrepreneurial businesses operated in New Jersey by Community Options to train and employ people with disabilities, providing support as well as camaraderie, while earning minimum wage or better. Presents of Mind is a boutique gift shop located in Morris County’s Flanders, where individuals learn customer relations skills and inventory management. Community Options also utilizes three complete office, conference and copy centers, known as the Daily Plan It, which provide tenancy to various small businesses. Individuals there receive training in clerical work and customer service. They are located in Princeton, Moorestown and Morristown. Park said they have a close relationship with the state, noting that the organization receives referrals from the state Division of Developmental Disabilities. For more information visit www.comop.org.